India 1st innings 327 and 2nd innings 7-117 (Gautam Gambhir 53*, Ravichandran Ashwin 11, Monty Panesar 5-61) leads England 1st innings 413 (Kevin Pietersen 186, Alastair Cook 122, Pragyan Ojha 5-143) by 31 runs. 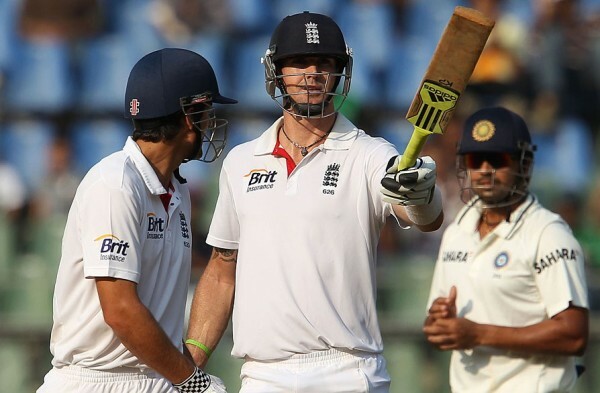 Kevin Pietersen lambasted the Indian bowling attack while Monty Panesar made a big dent in the hosts batting well assisted by Graeme Swann in the second Test. India scored 327 runs in the first innings followed by 7-117 after 33 overs in the second and England amassed 413 in their first turn. 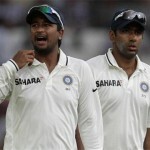 The exciting day three of the second Test concluded on Sunday, November 25, 2012, at Wankhede Stadium, Mumbai. Earlier, England initiated the day at 2-178 after 65 overs, their skipper Alastair Cook and star middle order batsman, Kevin Pietersen were unbeaten on 87 and 62 runs respectively. The pair took off well by scoring 10 runs in the second over of the day and kept on running the score board. Cook smashed his 22nd Test century on the first ball of the 76th over with a four and that was his fourth ton in four Tests. 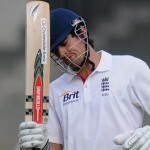 Pietersen blasted his 22nd Test hundred two overs later with a four as well and the 250 of the innings was posted on board with a six from him in the 81st over. The third wicket partnership associated a 206 runs match winning partnership and enhanced the total to 274 when Alastair Cook was caught behind by MS Dhoni off Ravichandran Ashwin for 122 from 270 balls with 1 six and 13 fours. 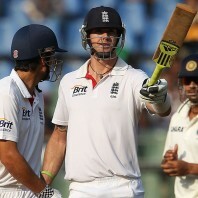 Pietersen took charge as Jonny Bairstow was gone for just nine runs and was replaced by Samit Patel. The later hit 10 runs in the 98th over with 1 six and 1 four as Kevin Pietersen went past his 150 runs mark with the same result shown by Patel earlier. The duo shared 59 runs for the fifth wicket as Samit Patel was caught by Virat Kohli at gully off Pragyan Ojha for 26 runs. Kevin Pietersen carried on with his onslaught and was finally caught behind by Dhoni off Ojha after playing a brilliant knock of 186 from 233 deliveries with 4 towering sixes and 20 well timed fours. The innings of the visitors was folded back on 413 runs in 121.3 overs and they secured a decisive first innings lead of 86 runs. Pragyan Ojha was once again impressive by grabbing five wickets whereas Ravichandran Ashwin and Harbhajan Singh shared two wickets each. The second innings of India started off with their regular openers, Gautam Gambhir and Virender Sehwag. The first seven overs resulted in 23 runs and the partnership was extended to 30 runs as Monty Panesar struck in the 8th over when Sehwag was gone for nine runs. The most competent batsman in the series for the hosts, Cheteshwar Pujara lost his wicket for just six runs and the disaster begun as the supreme batsman of the cricket world, Sachin Tendulkar was declared leg before wicket off Panesar for eight runs. The countdown for the calamity of India started as the deadly spinner’s duo of Monty Panesar and Graeme Swann made the life difficult for the home batsmen. Gautam Gambhir stood firm when the wickets kept on plundering from the other end at the regular intervals. They were reeling at 6-92 in 27.3 overs after Yuvraj Singh and MS Dhoni also went back to the dressing room for just 8 and 6 runs respectively. Ravichandran Ashwin got together with Gambhir and the first hundred of the innings was displayed on board in the 30th over. Ashwin hit the first six of the Indian innings but Panesar got rid of him on the fourth delivery of the 32nd over for 11 runs. Harbhajan Singh was the new batsman in as Gambhir achieved his 20th Test fifty on the second ball of the 33rd over and held his end for 53 as India reached 7-117 in 33 overs. Monty Panesar was the main destructor from the tourists by grabbing five wickets and Graeme Swann got two. India has earned a lead of just 31 runs with three wickets left in the second innings and England is in sight of clinching the Test on the fourth day.